I’ve been enjoying a needed break from blogging this year but I thought it was time to pop my head up and share some thoughts. So I put together a round-up of current SEO and digital marketing trends that offer good opportunities for publishers. Some are newer, others are longstanding, but I wanted to gather them together and focus on the benefits for news and content sites. A key point of emphasis is that the first two items are reflective of a growing trend away from the website as we know it. Traditional websites will continue to be the primary digital home for news organizations, but the lines are shifting and more change is coming. Are you taking full advantage of these opportunities? As a user I like the new hosted and mobile-specific article formats, be that Facebook Instant Articles, Apple News Format or Google’s AMP project. Fast and clean is a good combination, especially on mobile. For publishers there is promise, however it’s too soon to say if the pros will outweigh cons such as giving up some control and/or technical complications. The open source nature of AMP is a plus but I’m not a fan of having to create separate URLs. Regardless, streamlined templates is where things are heading so it is important to experiment and learn how to make the most of it. App Indexing for both Google and Apple is another growing trend. There hasn’t been a major payoff for editorial content yet but with digital activity increasingly moving to mobile this is an important opportunity to take advantage of. Emily Grossman wrote a couple of excellent articles on app indexing for Apple Search/iOS and Google Search that are well worth reading. App store optimization (ASO) is another component that is important to dial in. For a good overview of the basic ranking factors see the checklists that Stephanie Beadell put together for the App Store and Google Play. Structured data markup and the schema.org vocabulary continue to grow in importance for conveying relevancy and taking advantage of additional features in the search results. For publishers schema.org article, video and organization markup are particularly important, and the new itemList markup for section pages has potential too. The support information on the Google Developers site covers the main opportunities. It’s great that Google is increasing support for JSON-LD because generally speaking this makes it easier to manage and troubleshoot the markup. It’s no secret that Google News needs a major overhaul; technical problems and indexation oddities are a frequent occurrence for most news sites. We spend a lot of time helping clients to troubleshoot news crawl errors that a more sophisticated Google News could eliminate altogether. Despite all that, Google News and particularly the “In the news” module in the Web search results remain strong opportunities for publishers, so it is important to optimize for news search as best as possible. Also take advantage of additional opportunities such as the “news_keywords” meta tag and Editors’ Picks RSS feeds. On the positive side, Google News has improved its outreach and support in the last year or two, making it easier for publishers to get information and assistance. Google News Publisher Center also appears to have greater impact than when it first launched, so be sure to submit all relevant information and actively maintain your profile. Site performance is something that Google continues to push, and since it affects both the on-site user experience and SEO making improvements is worthwhile. The exact SEO impact is difficult to quantify with certainty, but publishers that invest in site speed efforts typically experience gains in organic search performance. Both through improved ranking signals and indirectly through increased user activity and engagement signals. Google PageSpeed Insights should be treated as no more than a rough proxy, especially because the scores are influenced in part by external resources outside of a publisher’s control. But it is a place to start, and when combined with other evaluation and monitoring tools like WebPagetest, Pingdom Tools and Rigor it can help you to develop a plan. Google Panda and other forms of algorithmic filtering continue to impact even reputable brands with quality content. The long, slow rollout currently underway for Panda 4.2 may ultimately prove to be a good thing (i.e. fewer sudden, radical changes) but it’s also left some quality sites that were hit by Panda 4.1 last year stuck at reduced levels. Glenn Gabe has some great analysis of where things currently stand as well as some significant fluctuation in September. So it is vital to be diligent and avoid potential risk factors that could have a major impact on search traffic. Syndication is an important audience development and traffic driving tool for publishers. It also comes with SEO risk factors, so it is critical to build safeguards into all syndication contracts. Cross-domain rel=canonical (when possible), an attribution link to the original and delayed release to partners are among the most important tactics. The use of sponsored content and native advertising also continues to increase as publishers look for additional sources of revenue. For this, it is essential to adhere to search engine requirements such as making all links to sponsor sites nofollow and preventing indexation in Google News. The bottom line with both syndication and sponsored content is they are good opportunities but when implemented incorrectly they can do more harm than good. So make sure to get it right. 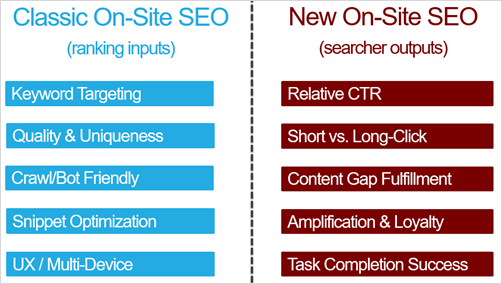 The takeaway here is to factor in the entire searcher and visitor experience into your optimization efforts, and to improve those signals relative to your competition. Check out his full presentation on SlideShare for more information and tips on making this actionable. I want to finish by emphasizing that the largest SEO opportunity still is, and will continue to be, establishing a solid foundation and ensuring that technical, editorial and marketing best practices are proactively applied across the organization. Simply put, that stuff works. Experimenting with new initiatives is strongly encouraged; it is important to test and learn, and continue to adapt. Just make sure you have the fundamentals covered too. Nice list Adam. I have to say that I like the changes which Google is introducing. Most blogger hate them because people are scared of uncertainty. However, all I see here is improvement. Sometimes, we tend to forget that we are also internet users and that these changes are something that we can also benefit from. Great .. All are new for me.